Red tape drive: have businesses really benefited? Have businesses, particularly smaller companies, really benefited from the government's war on red tape and if not, why not? In November 2014, Business Minister Matthew Hancock announced that the government campaign to cut red tape has saved businesses more than £200 million. However, there is doubt as to whether this deregulation has made a lasting -or indeed any - impact for the majority of businesses. A survey by business information firm Croner in February last year uncovered that just 7% of the businesses questioned thought that the deregulation efforts had had an impact. 52% said there had been no impact and 41% weren’t sure. Similarly, according to the Chartered Institute of Accountants in England and Wales, 9 out of ten businesses haven’t seen any improvements as a result of deregulation. The government introduced the Red Tape Challenge to gather thoughts on which regulations should stay, be merged, clarified or scrapped. The consultation lasted for two years from April 2011, with the aim of identifying 3,000 regulations to scrap or improve. These are still being implemented. According to Business Minister Matthew Hancock, the ‘war on red tape’ has managed to save businesses £10billion as a whole over the past four years. 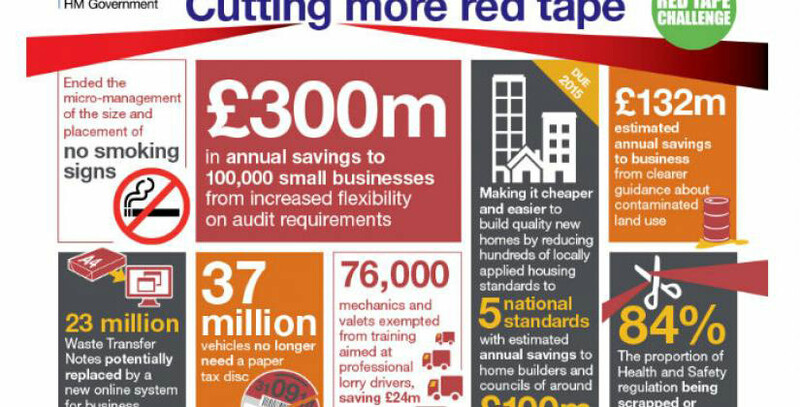 The image above is the government's infographic highlighting 'some of the key results from the Red Tape Challenge'. However, a study by Reform found that although the government had reduced £1.2 billion worth of regulation since 2010, it had actually added an extra £4.3 billion. Despite these findings, the red tape challenge has certainly had some wins. Changes to redundancy rules and rules for auditing accounts will help businesses and changes like no longer needing a paper tax disc are also beneficial. Another raft of cuts announced recently, including simpler environmental guidance and moving more compliance and recording online will help to reduce administrative burdens. This was never going to be an easy task, but there now a better system for monitoring, measuring and controlling regulations. There is also the Small Business, Enterprise and Employment Bill, which aims to support small businesses by tightening rules on zero-hour contracts for example. However, many argue it doesn’t go far enough. The Guardian has a good article on this. In the meantime, according to the FSB, microbusinesses are still paying disproportionately more than larger companies to ensure they comply with regulations. Plus there have been many changes in the last year that have no doubt added to the costs of companies that employ staff, such as flexible working, real time payroll and automatic pension enrolments. It's doubtful whether the bill will offset the costs of all of these. The main criticism of the work is the monetary value businesses will have saved from these changes as well as the impact the changes have had. Many of the regulations that have been scrapped or amended were redundant in any case, or rather pointless. For example, bus companies previously had to hold onto all items that passengers had left behind for at least 48 hours, which included decaying food. Changing this regulation is no doubt a sensible move and the bus companies should appreciate this. However, the majority of businesses wouldn’t have seen any benefits from changes like these. They probably didn’t know about the senseless regulations in the first place, making it less of an achievement in the eyes of many. Some of the necessary regulations introduced have also come from the EU, which itself is now attempting to cut red tape, after opinion polls show many perceive the EU to be a “bureaucratic monster”. According to the Stoiber report, they aim to make microbusinesses and SMEs exempt from as many regulations as possible. But since the majority of EU businesses are SMEs, this sounds a little short-sighted and would undermine the regulations designed to improve safety and standards. Many businesses are also not aware of the one-in, two-out rule to cut red tape. This aims to ensure that for any regulation coming in, savings need to be made that amount to at least double the cost of the incoming regulation. This is important to try to keep the cost and burden of regulations down for businesses. While the majority of businesses may not have benefited from any changes at the moment, that doesn't mean that the whole process has not been successful, just perhaps not quite as successful so far as the government claims.